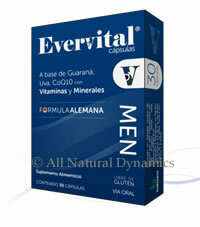 Evervital Men is a multivitamin with minerals for men based on Guarana, Grape, Coenzyme Q10 and Lycopene plus vitamins and minerals. Evervital Men's active ingredients help and protect the cardiovascular system, to maintain vigor, physical and mental health in men. When Are Evervital Men Vitamins Recommended? Evervital Men's vitamins is recommended for people with general physical weakness, for men who feel tired all the time and for men who feel sleepy during the day. Coenzyme Q10 is a powerful antioxidant that helps protect men against free radical damage, apart from playing a key role in cellular energy production. Because cellular activities are energy dependent, coenzyme Q10 is essential for the functioning of almost all cells in the human body. Lycopene is a chemical responsible for providing the red color of fruits and vegetables. Lycopene is a valuable and powerful antioxidant that helps protect cells in the body from being damaged. Lycopene is able to neutralize the oxidizing action of free radicals, releasing its properties into the blood that are captured by free radicals and prevent damage to molecules and cell membranes. Guarana is a plant that acts on the body helping with its therapeutic properties to protect the cardiovascular system, the central nervous system and the digestive system. What is Guarana Recommended For? Help for memory and concentration.